The (effort) estimation method weighing the results (see our Intermediate course) gives a reliable estimate with a certain ‘standardized’ risk allowance. In other words, there is a substantial chance of being late (area shown by green arrow). If the circumstances for particular tasks are such that you want to allow less risk on the task, look for the estimate that corresponds with less risk. Inevitably, allowing less risk comes at the price of assigning more work/lead time to a task. 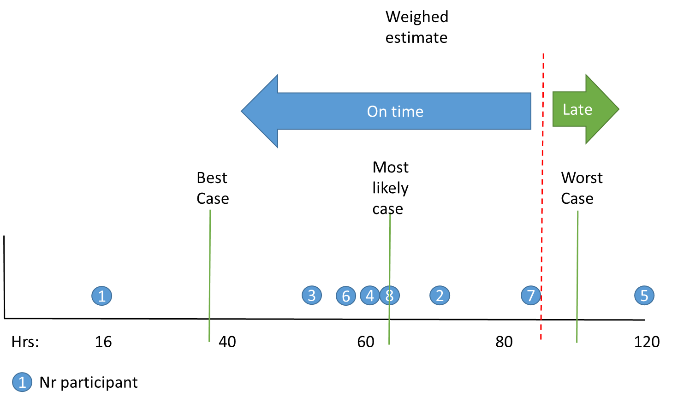 In the image above, the red line is moved to the right, meaning less risk of being late is accepted. Consequently, the corresponding estimate needs to be used in MS Project. 1. All estimates carry an inherent degree of uncertainty, especially in the early stages of the project where there are more unknowns. It is crucial that you quantify the percentage of unknowns in your estimate and compensate with an equivalent level of contingency (a likely eventuality you factored in based on risk assessment). For instance, if you know from experience that on average 25% of your work is unforeseen, you can factor in this 25% in your estimates. 2. Make sure you factor in all phases and activities (later phases and activities on a higher level, e.g. per phase) of the project. Also include specific time for management activities such as project management, team management, technical guidance, training, etc. if it is not already accounted for. 3. Factor in the effort hours based on the actual resources assigned. If the actual resource doing the task is not the person/skill level that was involved/considered in the estimation session, review if the estimate is still correct. Different skill levels can play a large role. 4. Consider rework. In a perfect world, all project deliverables would be correct the first time. On real projects, that usually is not the case. Work plans that do not consider rework can easily end up underestimating the total effort involved with completing deliverables. This is not to be confused with scope changes. If you produce a deliverable that does not meet all the original requirements, or has a quality problem, then rework may be required. For instance, meet with your colleague that will continue on your work (successor task) and align on the ‘must have’ specs for him or her to be able to proceed. More about tasks, durations and estimations you can learn in our Intermediate e-course. 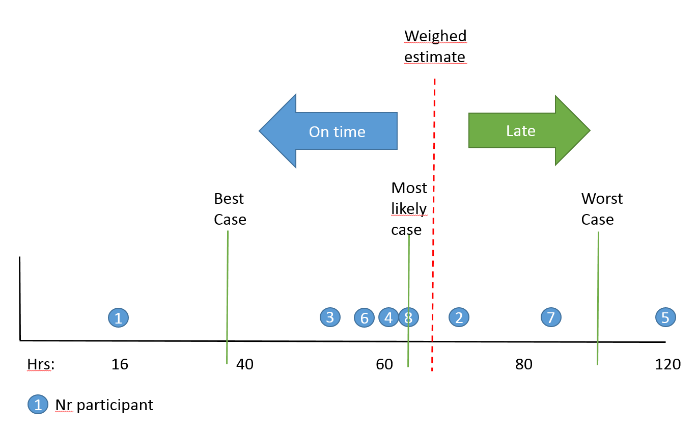 How do you consider risks when estimating efforts in your MS Project schedule?